FrontPoint’s employees are really our greatest asset, so we’re extremely gratified to learn that the FrontPoint experience is as positive for our employees as it is for our customers. FrontPoint Security, a nationwide leader in wireless home security, was recently named as one of the 2012 Best Places to Work in Virginia. The annual list of “Best Places to Work” was compiled by Virginia Business Magazine and Best Companies Group. This exciting initiative is dedicated to finding and recognizing Virginia’s best employers, thus benefiting the state's economy, its work force and businesses. The program is based on optional employee surveys designed to measure the employee’s level of engagement and satisfaction with their company. The survey covers areas such as company culture, environment, leadership, planning and development. The Best Places to Work in Virginia list is made up of a total of 70 companies, split into three groups, based on size of the evaluated companies. 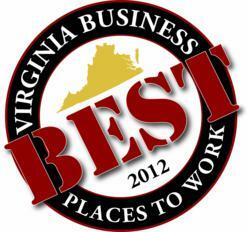 For more information on the Best Places to Work in Virginia program, visit http://www.BestPlacesToWorkVA.com. FrontPoint Security is a leading nationwide provider of interactive, wireless home security systems. FrontPoint combines next generation technology with remarkable simplicity and commitment to service, resulting in a safer and unique customer experience. With customers in all fifty states and Canada, FrontPoint Security is one of the fastest growing alarm companies in North America. FrontPoint is a GE Security Authorized Dealer and Alarm.com’s Preferred Dealer for no-hassle security solutions. For more information, please visit http://www.FrontPointSecurity.com or call 855.296.3945.